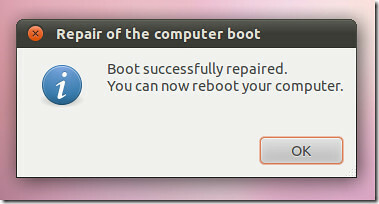 Boot Repair is an Ubuntu tool which can easily resolve such issues. As this is a GUI based application, therefore, you will require being logged into your operating system for it to work. Therefore, despite the boot issues, you should be able to get access to your desktop for this app to resolve the boot issues. Having said that, the issues which it resolves mainly do not cause the inability of a system to loose boot functionality. 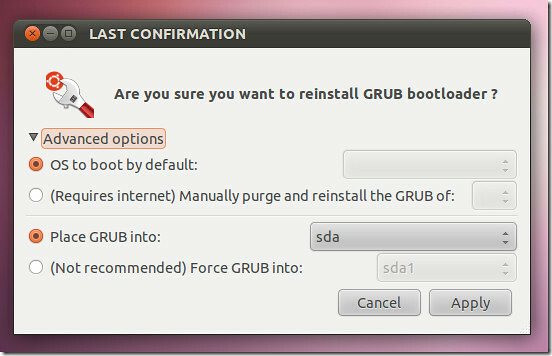 For example, the GRUB boot problems may be causing inconsistency in allowing you to boot from your OS. Similarly, if you have installed another operating system, you might not be able to login from Ubuntu by default. A confirmation prompt will inform you that the boot options were successfully resolved. You will require restarting your system for the changes to take effect. Boot Repair is a good application for resolving minor boot issues such as the ones mentioned above. It serves as a one stop repair mechanism to fix GRUB and associated boot issues in a few clicks. You can also Download Boot Repair from the Launchpad link given below. No Comment to " Install YannUbuntu Boot Repair on Ubuntu/Linux Mint "